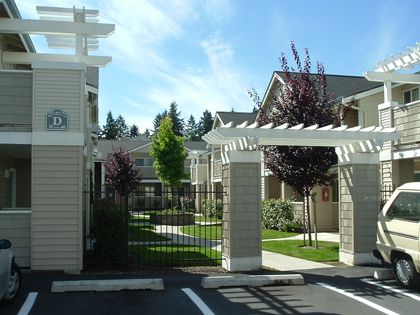 Existing 1960's/1970's era apartments were renovated and updated to create a marketable and enjoyable community. Additional infill apartments were added to increase net density on the site. Enclosing the site is a new wrought iron picket security fence with gates which close in the evenings to limit non-resident access. As part of the renovation process, agreements with the city resulted in the closing of Alder Street, which provided controlled vehicle access and additional parking for tenants. Garages and carports were added as well.